Over the past decade, more than 800 journalists have been killed in the line of duty, and only 8% of these cases have been resolved. These are the official figures of the Director-General of UNESCO, an organization of 195 Member States. The 92% unresolved cases tells the public that free expression is not protected. It tells them that society cannot ensure their right to information. This is why every Government must act upon its responsibility to investigate crimes against journalists. Every government has to act timely and thoroughly, if they are to set a precedent for other cases. If we allow any form of violence against journalists, we allow impunity to prevail. Impunity is the failure to guarantee justice and when impunity prevails in cases of violence against journalists, as well as against human rights defenders, it is an invitation not for one, but for many more cases to occur. This is the message we send on 2 November, International Day to End Impunity for Crimes against Journalists. This is an important day, not only to commemorate and honor all those who have died in the line of duty, but also to call for justice in cases of violence and harassment against journalists. Harassment against journalists in any form must be rejected, including arbitrary arrests and verbal intimidation. Ending impunity on all of these acts is the most important step to guarantee the safety of journalists. Protecting journalists and guaranteeing a free press is essential for the development of societies and important for every woman and man to exercise their right to access information, their right to participate as citizens in democracy, and to work for the right to development. This is important, because we need free expression, democracy and access to information to drive more inclusive sustainable development. That is why the Sustainable Development Goals, agreed on last year by all states in the United Nations, recognized in Goal 16.10 the need to guarantee their “public access to information” for guaranteeing the achievement of the 17 Goals. Journalism is what enables citizens to exercise their right to be informed, their right to know and their right to assure accountability of those in power. Every time a journalist is attacked, threatened, assassinated or harassed and the case is not investigated, it is an invitation for more violence. Every time there is no justice for a journalist who is victimized, it emboldens the attackers to continue. The date of 2 November is the anniversary of the murder of two French journalists in Mali in 2013. 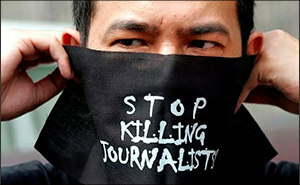 Four years earlier, more than 30 journalists were murdered in the Maguindanao massacre in the Philippines, which has been the single deadliest attack against journalists in history. Neither case has yet been resolved. To help secure justice for journalists, UNESCO works with judiciaries around the world, to sensitize them about the importance of cases in which journalists are killed. UNESCO also partners with media, governments and civil society groups to also raise awareness on this issue. This action is taken forward by the UN Plan of Action for the Safety of Journalists and the Issue of Impunity, which calls for wide-ranging partnerships amongst interested parties and was welcomed by the United Nations General Assembly Resolution of 18 December 2013. The 2nd of November is a day to call for justice, to fight for the safety of journalists and to end impunity. It is a day to call upon governments to respond to the cases of journalists killed, and to encourage the justice systems to conduct timely and effective investigations into the crimes committed against journalists. Eradicating impunity for attacks on journalists is fundamental for free expression, human rights and public access to information. It’s what everyone should be calling for.